The psychedelic state has been both demonized and mythologized, but what is it really like to trip? 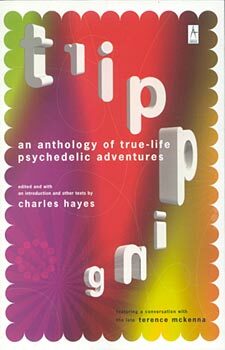 In Tripping, Charles Hayes has gathered fifty narratives about unforgettable psychedelic experiences from an internation array of subjects representing all walks of life -- respectable Baby Boomers, aging hippies, young ravers, and accomplished writers such as John Perry Barlow, Anne Waldman, Robert Charles Wilson, Paul Devereux, and Tim Page. Taking a balanced, objective approach, the book depicts a broad spectrum of altered states, from the sublime to the terrifying. Hayes's supplemental essays provide a synopsis of the history and culture of psycehdelics and a discussion of the kinetics of tripping. Specially featured is an interview with the late Terence McKenna, who was perhaps the preeminent psychedelic spokesperson of our time. A storehouse of astonishing, often otherworldy tales, Tripping is a compendium of forbidden memories that enables readers to trip vicariously or compare notes on their own experiences. "I couldn't stop dipping in and out of this juicy book, flying from New York to Detroit and back. At times it felt like just reading it was keeping the plany up. Wow! What a contact high." "Tripping is the best collection of psychedelic travelers' tales that I have read in a long, long time. It should be in the knapsack of anyone contemplating passage through what Aldous Huxley called the 'reducing valve' of normal consciousness--and out into the great beyond." "Provides the much needed 'coming out of the closet' that the psychedelic movement has lacked. These stories will captivate, inspire, caution, and educate. This courageious book exceeds expectations." "A magnificent collection of psychedelic travels by true explorers."